The game consists of a large mapboard of Japan, broken down in to provinces which have corresponding cards to show ownership. Players split the cards evenly, populate their provinces with a spearman. 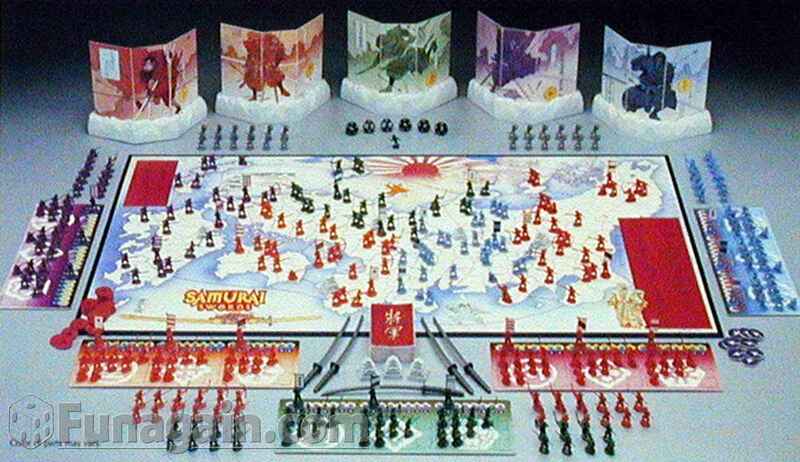 They also get three armies (represented by a daimyo figure that corresponds to the army on another small army board. They also get a figure carrier fashioned to look like a fortification into which plugs a cardboard screen with all of the important rules on it. The plastic pieces include three daimyos, samurai (bowmen and swordsmen), and ashigaru (spearmen and riflemen.) Set up takes a bit of time, and does involve some strategy in the placement of units and armies. Play is quick and easy. Each turn, you count the number of provinces and get a number of koku (money) to build fortifications (nifty fortress bases and castles), hire a ninja to assassinate your enemies, build your units. Order of play is decided by picking wee katana swords with a number of pips on them. The randomizers are d12s. Average play time is about 2-3 hours depending on the number of players and they quality of play. The game is deceptively simple from a rules set standpoint: collect your money, build your units, etc., attack your enemies, repeat… The fights are ordered from the ranged weapons — bowmen and riflemen, to the daimyo, through the swordsmen and spearmen. Organizing your armies and standing guard in the provinces takes a lot of care and planning, and even the best plans can be laid low by chance. We’ve had some excellent games where it seemed one player was neigh invincible, only to have one single battle go awry and the player be taken out of the game early. Quality of the Shogun and Samurai Sword sets is lovely — good cardstock, nice plastic figures, excellent artwork. I can’t say for Ikusa but I’m assuming it remained the same. If you find it on eBay or elsewhere, it’s a definite buy.